Art for Society's Sake: The WPA and Its Legacy, on view at the Pennsylvania Academy of Fine Arts (PAFA) through April 6th, recalls an era in this country when the dissemination of art was a governmental duty, with the arts substantially funded on the federal level. While the works on display, all from the permanent collection, have no shortage of power or merit, this exhibition is thematically less about the art itself and more about what the mere existence of this art means. Part of Roosevelt's New Deal under the Federal Art Project, the Works Progress Administration (WPA) and the Public Works of Art Project (PWAP) were dedicated to employing artists and fostering the creation of art all over the country -- largely in the form of city murals, but also through painting and sculpture. At its height, the WPA and PWAP employed over 5,000 artists, all of whom were able to create artworks with some measure of autonomy. The WPA served not only to employ artists and artisans during the Great Depression, it also had the aim and effect of beautifying the country through public art, fostering the development of artists in the US, and promoting the arts in all levels of society. 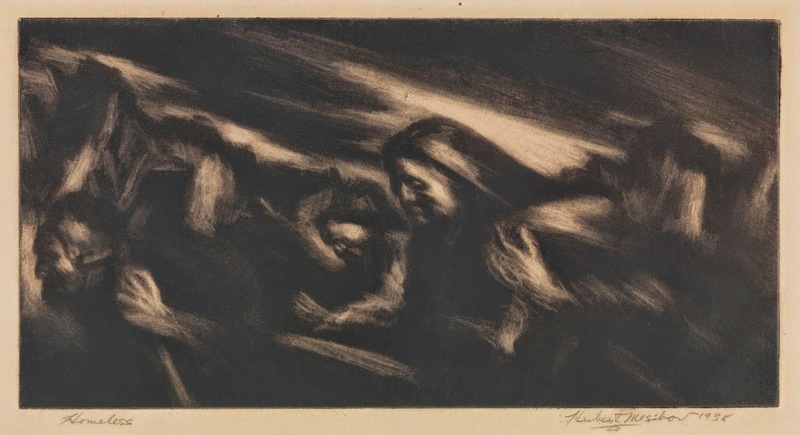 Hugh Mesibov, Homeless (1938), Carborundum print on ivory wove paper, 5 3/8 x 10 3/8 in., John S. Phillips Fund, 1987.11.1, Courtesy Pennsylvania Academy of the Fine Arts. Hugh Mesibov, Smoke n' Gin (1938), Color carborundum print on cream wove paper, 9 15/16 x 7 15/16 in., Gift of the artist, 1987.14, Courtesy Pennsylvania Academy of the Fine Arts. Art for Society's Sake displays a truly diverse range of artists from both the time of the WPA and afterwards, showing a wide range of artistic styles that reflected, to some degree, the struggles and lives of Americans of all backgrounds. The WPA-era works span many artistic movements and cover a wide range of subjects, from portraiture, to nature scenes, to cityscapes, to works of the Social Realist movement, which concerned itself with the plight of workers and the greed of the wealthy, to deeply affecting artworks addressing the grim racial realities of the 1930s and 1940s in this country. While there was some fear of censorship and blacklisting due to perceived Communist alignments or sympathies, as noted by Jackson Pollock and his brothers, who worked in the WPA, on the whole, the artists represented in this exhibit manage to engage with sensitive subjects such as racial and class struggles. The relative freedom of expression allowed during this time led to the diverse range of works on display in the PAFA exhibition, organized simply but effectively in chronological order from right to left around the large room dedicated to the show. When the WPA ended and the NEA later rose to fill some of the gaps, the type of art being supported changed in style and tone, beginning to focus on overtly political race- and gender-based issues. Blurbs throughout the exhibition reiterate the importance of the WPA at the community level -- how WPA funds gave people all over the country access to art education, be it in painting, sculpture, printmaking, and/or other art forms. The show keenly highlights Philadelphia's unique role in the dissemination of art throughout the region through its then-fledgling print and lithograph communities. 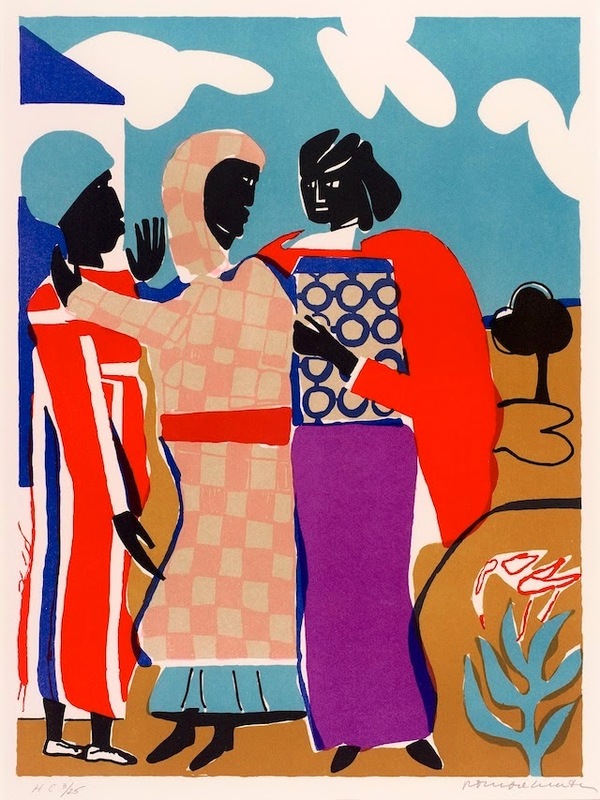 Romare Bearden, Three Women (1979), Color lithograph on paper, ed. 3/25, 20 3/16 x 15 in., The Harold A. and Ann R. Sorgenti Collection of Contemporary African-American Art, 2004.20.5, Courtesy Pennsylvania Academy of the Fine Arts. Highlights of the show include vivid black-and-white works by Hugh Mesibov. "Homeless," a 1938 print, is a powerful depiction of some of those most neglected by society, created in smoky fleeting lines. 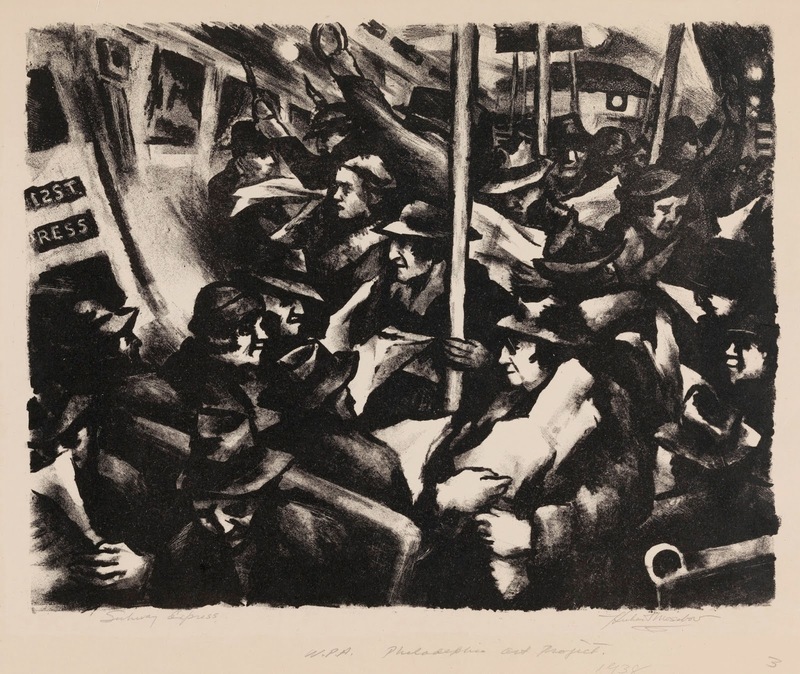 "Subway Express," a 1938 lithograph, is a chaotic swirl of movement, punctuated with rough, expressionistic lines. 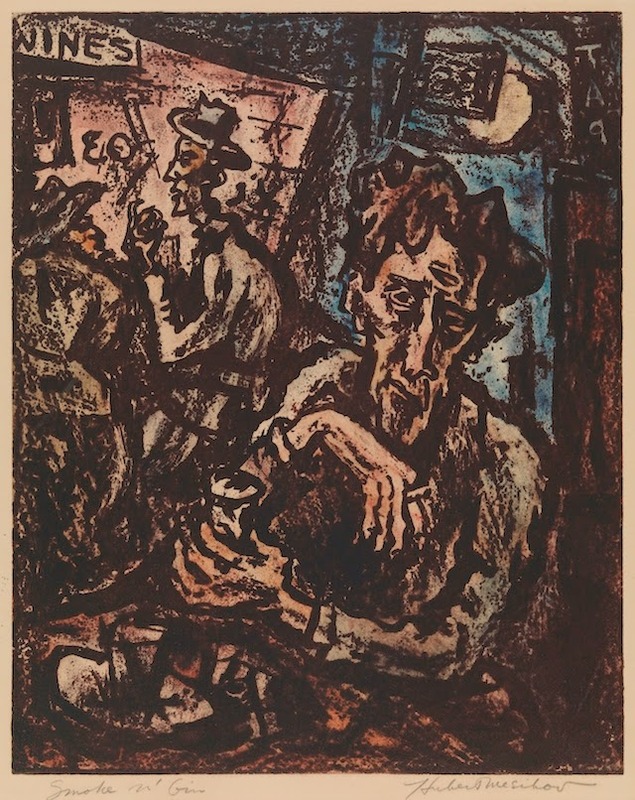 Also by Mesibov is "Smoke and Gin," a 1938 print of a working-class man, worn ragged from labor, sitting at a table with a drink. Also visually arresting is Romare Bearden's "Three Women," a Matisse-esque 1979 lithograph of three African-American women, dressed in brightly-colored clothing, whose affection towards one another is palpable and charming. The last quarter or so of the show is dedicated to works that post-date the WPA, describing the role of the NEA and displaying several works that came about through NEA funds. In contrast to the WPA, the NEA is less project-based and more focused on giving individual artists the resources to grow and explore their craft. As a result, however, the effects of the NEA are harder to trace. The final wall of the exhibit is dedicated to some of the better-known artists who have benefited from the NEA's largesse, but it is clear that, the existence of the NEA notwithstanding, it has become less of a priority in the United States to support the visual arts than it was during the Great Depression. Hugh Mesibov, Subway Express (1938), Lithograph on ivory wove paper, 11 x 14 in., 1987.11.2, Courtesy Pennsylvania Academy of the Fine Arts. What then of the United States' legacy as a cradle for artistic production? NEA spending on the arts is dramatically less, either in total or per capita, compared to that of most of the countries in Western Europe, with no sign of increase in sight. Indeed, the NEA's small budget has been highly contested by those in government who would defund it entirely. In 2011, Rep. Jim Jordan and the Republican Study Committee proposed cutting the NEA's budget entirely; in the 1990s, the NEA was again targeted by conservative Republicans who found its purpose to be a waste of money. In 2013, the NEA spent $138.4 million. In contrast, Germany spent about $1.63 billion, while France gave its Ministry of Culture a budget of around $10 billion. While the latter two countries demonstrate increased spending each year, the United States budget has declined since its 1992 peak of $175 million dollars. For per capita reference, as of 2014, the United States had a population of 318,892,103, while Germany and France have 80,996,685 and 66,259,012 respectively. Even Northern Ireland, with its population of 1.8 million, spends roughly $21 million dollars on the arts, while Sweden spends $15 million dollars on the arts for its 9 million citizens. While the WPA was not a perfect bastion of artistic freedom and expression, Art for Society's Sake provides a paradigm for what greater federal economic support for the arts could look like. This exhibition is therefore about the power and impact of art, and a strong argument for what can and should be done to support it. TELEVISION REVIEW: "Halt and Catch Fire"